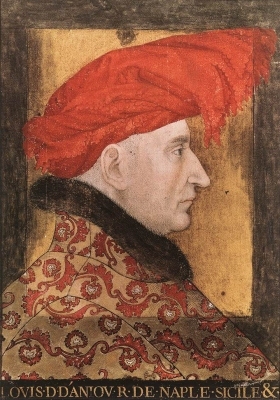 Jean I d'Armagnac, Comte d'Armagnac married Beatrix de Clermont, daughter of Jean de Clermont, Seigneur de Charolais and Jeanne d'Angiers, circa May 1327. He died after 5 April 1373. Antoine de Valois, Duc de Brabant was born in 1384.1 He was the son of Philippe II de Valois, Duc de Bourgogne and Marguerite de Flandre, Comtesse de Flandre.1 He married, firstly, Jeanne de Luxembourg, daughter of Waleran de Luxembourg, Comte de St. Pol et Ligny, in 1402.2 He married, secondly, Elisabeth von Görlitz, daughter of Johann Herzog von Görlitz and Richardis von Mecklenburg, in 1409.2 He died in 1415 at Agincourt, FranceG, killed in action.1 He was buried at TervuerenG. Louis II, Duc d'Anjou was born on 5 October 1377. He was the son of Louis I, Duc d'Anjou and Marie de Châtillon.3 He married Yolande de Aragón, daughter of Juan I, Rey de Aragón and Mathe d'Armagnac, on 2 December 1400. He died on 26 April 1417 at age 39. He gained the title of King Louis II of Naples.1 He succeeded as the Comte de Provence in 1384.4 He gained the title of Duc d'Anjou in 1384. Urraca de Portugal was born after 1150. She was the daughter of Afonso I de Bourgogne, Rei de Portugal and Matilda di Savoia.1,2 She married Fernando II, Rey de León, son of Alfonso VII, Rey de Castilla and Berengaria de Provence, in 1165.1 She and Fernando II, Rey de León were divorced in 1175.1 She died in 1188. Afonso I de Bourgogne, Rei de Portugal was born in 1094.2 He was the son of Henri de Bourgogne, Comte de Portugal and Theresa de Castilla, Infanta de Castilla.2,3 He was also reported to have been born on 7 November 1110. He married Matilda di Savoia, daughter of Amadeo III Conte di Savoia and Maud d'Albon, in 1146.3 He died on 6 December 1185. He was the earliest King of Portugal, Being only two years old at the death of his father, the management of affairs fell to his ambitious but dissolute mother, Theresa of Castille, until 1128. [S16] Louda and MacLagan, Lines of Succession, table 114.